Two Cosmic Microwave Background anomalies hinted at by the Planck observatory's predecessor, NASA's WMAP, are confirmed in new high-precision data revealed on March 21, 2013. In this image, the two anomalous regions have been enhanced with red and blue shading to make them more clearly visible. While we may never know all the details of our universe's explosive birth, scientists have been able to piece together quite a bit by studying the ancient light that saturates the cosmos. The universe burst into existence 13.8 billion years ago in a "Big Bang" that blew space up like a giant balloon. For nearly 400,000 years after that, the universe remained a seething-hot, opaque fog of plasma and energy. "As far as we know, that's as far [back] as we can see — we get an image of the universe as it was when it was about 389,000 years old," said John Mather of NASA's Goddard Space Flight Center in Greenbelt, Md., senior project scientist for the space agency's James Webb Space Telescope, the successor to the Hubble Space Telescope. Mather and George Smoot won the 2006 Nobel Prize in Physics for their work on NASA's Cosmic Background Explorer satellite mission. "We believe — although it's not 100 percent proven — that spots that we see in the microwave map from when the universe was 389,000 years old were actually imposed on it when [the universe] was sub-microseconds old," Mather told SPACE.com. "There's an interpretive step there, but it's probably right." The CMB, which was first detected in 1964, is strikingly uniform. But COBE discovered in 1992 that it's studded with tiny temperature fluctuations. These variations have since been mapped out more precisely by two other space missions, NASA's Wilkinson Microwave Anisotropy Probe (WMAP) and the European Planck spacecraft. The hot and cold areas — which differ from their homogeneous surroundings at a level of just 1 part per 100,000 — signify areas featuring different densities. "Light that's coming to us from the bottom of this gravity well has to climb uphill, so it's losing energy," Kogut told SPACE.com. "So the cold spots in the microwave sky are the places where there's extra matter and energy — extra gravitational potential. The hot spots are the voids." These density fluctuations were the seeds that eventually gave rise to stars, galaxies and all other structure that we observe in the universe today, scientists say. Most researchers think the "bang" portion of the Big Bang came during a dramatic and extremely brief period of inflation, which began about 10 to the minus 36 seconds — one trillionth of a trillionth of a trillionth of a second — after the universe's birth. 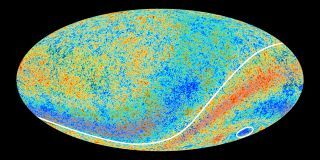 The precision mapping of the CMB performed by COBE, WMAP and Planck has provided strong support for inflation, helping cement its position as the leading explanation of the universe's first few moments. "Why the cosmic microwave background temperature is the same at different spots in the sky would be a mystery if it was not for inflation saying, well, our whole sky came from this tiny region," Bennett told SPACE.com. "So the idea of inflation helps answer some of these mysteries, and it explains where these fluctuations came from." Still, the CMB map has yet to reveal a clear "smoking gun" for inflation, Bennett and Kogut said. But they believe that smoking gun may well be there, just waiting to be discovered. According to inflation theory, the dramatic expansion of space in the first few moments after the universe's birth would have generated gravity waves, which in turn produced a type of polarization in the CMB known as "B-modes." Spotting B-modes would thus put inflation on incredibly firm footing, and reveal more details about the process — including, most likely, the energy levels at which it occurred. (Some scientists think these energies were so great that the laws of physics blended together during the inflation period). This signature has not been detected in the CMB map yet, but that may simply be because it's so faint, researchers say. "There are a few groups now out searching for these B-modes," Bennett said. "It's sort of the current Holy Grail of the business here." Bennett and Kogut are among the scientists in the hunt. Bennett is leading the development of an instrument called the Cosmology Large Angular Scale Surveyor (CLASS), which is currently under construction and could begin operations in Chile's Atacama Desert sometime next year. Kogut, for his part, is principal investigator of a balloon-borne detector called PIPER (short for Primordial Inflation Polarization Explorer), which he hopes will make its first flight in 2014 or 2015. Detecting the B-modes is a tough proposition, since it will likely require spotting a pattern that differs from the background by just a few parts per billion. But Kogut and Bennett both expressed optimism that somebody will find the signal, if it does indeed exist at the level predicted by some of the leading inflation models. "The sensitivity of the instruments has been making steady progress," Kogut said. "In order to see the inflationary signal, we probably need to improve by another factor of three or four." "But the sensitivity has already, since the first detection [of the CMB], improved by about a factor of 100,000," he added. "So I think it would be unduly pessimistic to say that all this great progress over the last 40 years, almost 50 years, is about to come to a screeching halt right before we discover this new signal that's right on the borderline of what we can and can't detect right now."